Carol Weiss is a retired South Orangetown Middle School science teacher. For many years, she has been volunteering in the Local History Room at the Nyack Library. Her research there has resulted in a number of articles for South of the Mountains about once prominent, but now largely forgotten, Rocklanders. She is already working on her next article, this time about a woman. Mrs. Horgan, Miss Couch and a Pickle: A light moment in the election year of 1934. Your editors ventured across the Hudson to photograph the haunts of John and Jessie Fremont in Sleepy Hollow. CORRECTION: On page 2 of the last issue, we made a mistake in the note about Marie Monteagudo, the author of "The Lost Eichlers of Rockland County." In fact, she moved to Chestnut Ridge in 2005. COVER PICTURE. 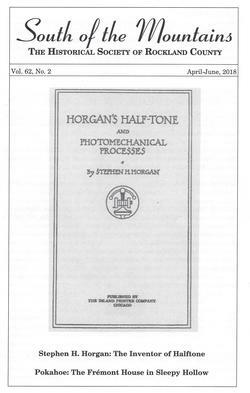 Title page of Stephen Horgan's best-known book, published in 1913. From the collection of the Nyack Library.